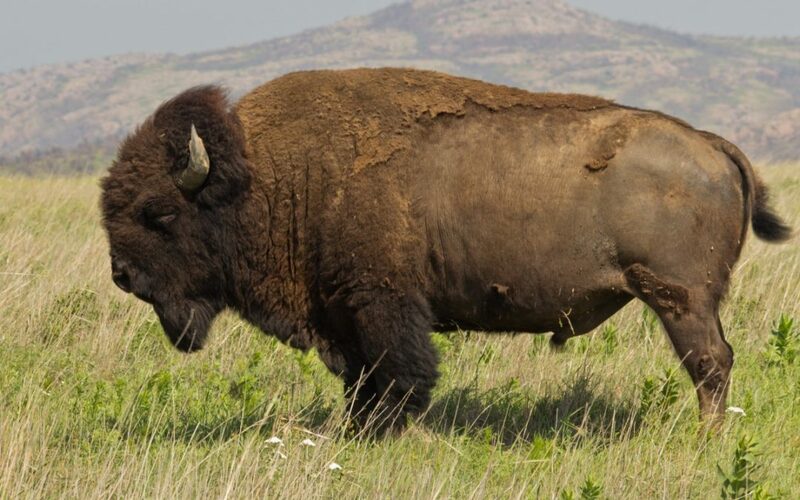 According to the textbooks, 95% of what bison eat is supposed to be grass. Talk to bison ranchers and they all have stories of crazy plants bison go after. Talk to bison managers at conservation units and they have similar stories. Rectifying the scientific and non-scientific stories is important. Assuming that bison only eats grass holds managers and conservationists back. If bison eat other critical plant species, but managers don’t know what these are, they might promote grass to the exclusion of more beneficial plants. Molecular analyses of diet can help. As part of a project, we’ve been comparing the diets of bison between Kansas and South Dakota. Bison, like many herbivores, are limited by protein throughout much of the year. Grasses can have a lot of protein, but nitrogen-fixing plants like legumes can have even more. But do the bison eat them? At the Kansas site, over 70% of the sequences in the diet were from N2-fixing plants like Ceanothus and legumes. At the South Dakota site, it could be as high as 30%. As far as we know, this doesn’t mean that 70% and 30% of their biomass intake is from N2-fixing plants. But it likely means that about that much of their protein does. We’ll publish more on these data soon, but these results are a testimony to the power of this technique for understanding the diet of animals, and the overhaul in our understanding of diet that is coming.